Congratulations to Drs. 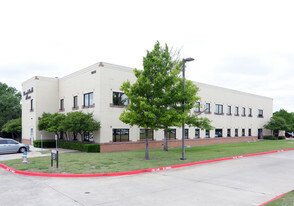 Clarke, Straughn, and Strong from our Dallas office and Drs. McGonnell and Mannering from our Plano office for being voted Mom Approved Doctors by DFW Child Magazine! We think they are great and we are pleased that local moms agree! We are pleased to announce that we now have Saturday morning clinic in both the Dallas and Plano offices. 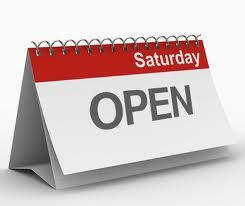 To schedule a same day sick appointment on Saturday, call the office you would like to be seen in between 8 and 10 am. Please be aware that on holiday weekends the Plano Saturday clinic may be canceled. 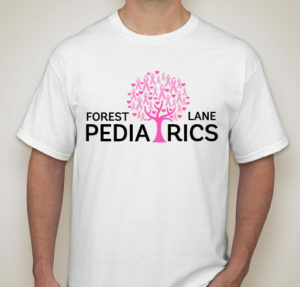 October is National Breast Cancer Awareness month and Forest Lane Pediatrics would like to invite you to join our fundraising efforts in support of the Susan G. Komen Breast Cancer Foundation. Click here to purchase a T-Shirt, and all proceeds go directly to Susan G. Komen Foundation! Flu vaccine for children ages 6 months and older are now available. This year’s vaccine has been updated to cover the new Influenza A strain that appeared last year. It is recommended that all adults and all children six months and older receive the vaccine every year. As always, we will be giving quadrivalent (four strains) preservative-free vaccines. In addition, we will be offering the Flumist nasal vaccine to children over two years old. To read more about the influenza vaccines for this year, visit the CDC website. We will be offering several Saturday morning vaccine clinics in both offices this winter. Our first clinic will be at our Medical City Dallas office on 9/15/18 and in Texas Health Plano office on 9/22/18. We will also be able to schedule weekday vaccine appointments on select days at both offices. You can schedule an appointment for a Saturday vaccine clinic through the Patient Portal, or by contacting either office during regular office hours. 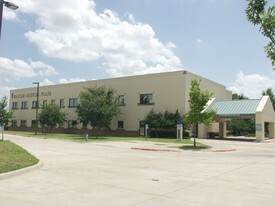 The Dallas phone number is 972-284-7770 and Plano is 972-526-0700. Congratulations to Drs. 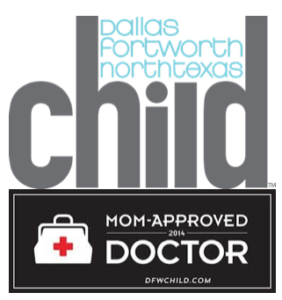 McGonnell, Mitchell, and Straughn on being chosen Mom Approved Doctors by DFW Child Magazine! Congratulations to Drs. Kravitz, Mitchell, and Straughn for being selected by D Magazine as the best Pediatricians in Dallas! Both the Dallas and Plano offices will be closed Monday, September 4, 2017 for Labor Day. Both offices will open and resume regular hours on Tuesday, September 5. Due to Forest Lane Pediatrics joining Privia Medical Group you may receive a notification from your insurance provider that we will no longer be in-network with that provider come October. Please be assured that we are still in-network with all insurance providers we accepted previously except Blue Advantage. Our old contracts were terminated when we joined Privia which triggered the sending of the letter by our old contract provider. What the letter fails to mention is that we now have new contracts through Privia so there is no gap in our in-network status and ability to care for patients on the plans we accept. As expected with insurance providers, there may be some technical hiccups during this transition. For example, if your insurance requires you to identify a Primary Care Physician (PCP) for your child, you will likely need to call them and reassign your doctor as the termination of our old contract likely disassociated your doctor’s name from your child’s insurance plan. Another problem some families may run into is that some of the insurance providers are slowly re-adding the names of our providers to their directory. This may mean that when you call to confirm that your doctor is in-network, they may say that she is not. We recognize this is frustrating and we are doing our best to resolve this issue. Please be assured, that even if the insurance provider does not have your doctor listed as being in-network, if your insurance is listed on our approved list, then we are in-network for your provider. If you have any questions about your insurance coverage, please message us through the portal or email our billing coordinator Maria@ForestLanePediatrics.com. As of August 1, 2017, we are proud members of Privia Medical Group! Privia is a large organization of independent physicians of different specialties that will provide us with additional resources to better care for our patients. As with any transition there will be growing pains and we ask for your patience. Please be aware that all patients will need to re-register with the practice and register on a new Patient Portal as part of this transition.